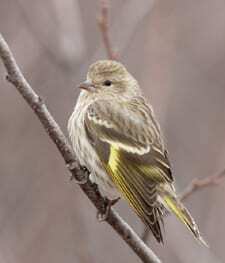 Flocks of tiny Pine Siskins may monopolize your thistle feeder one winter and be absent the next. This nomadic finch ranges widely and erratically across the continent each winter in response to seed crops. Better suited to clinging to branch tips than to hopping along the ground, these brown-streaked acrobats flash yellow wing markings as they flutter while feeding or as they explode into flight. Flocks are gregarious, and you may hear their insistent wheezy twitters before you see them.